Neat? Not neat? Whichever! 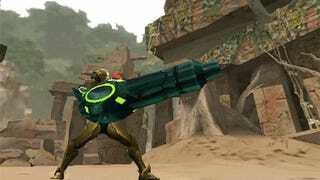 Samus is going to appear in special Monster Hunter 4G side quest downloadable content, complete with giant weapons. Yes, this is the Samus from Metroid: Other M, and she will be playable in both her Varia Suit and her Zero Suit. The quest DLC will be available for download from December 17 to January 28, 2015 for members of 7-Eleven's free wifi service Seven Spot. It looks like the game's international release next year is getting this collaboration as well.